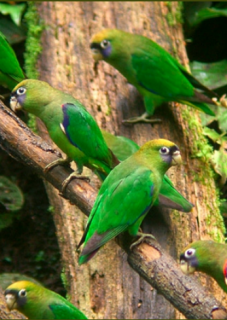 The Scarlet-shouldered Parrotlet is so quiet and shy that individual birds are easily overlooked, whereas whole flocks of these birds suddenly appear in trees, as if out of nowhere. Male-underparts with green and yellow; blue/black face, turning to deep blue on forecheeks; pale olive/brown ear coverts and crown; dull blue thighs; yellow undertail coverts; scarlet bend of wing, underwing coverts and axillary feathers; green central tail feathers widely tipped with black; side tail feathers dark red tipped with black. Bill olive/yellow with grey at base. Eye ring prominent and bare, and white. Eye dark brown. Female-green/yellow lateral tail feathers with black tips. As in adult female but blue/black on forehead and lores absent. Calls made in flight are two-syllable tweeting notes; also nasal, whining notes repeated often. Is declining locally with deforestation. Some local trade. Scattered throughout Amazonia, from N Guyana, NE and S Venezuela and S Colombia to N Bolivia. Also in N Brazil south of Amazon River. Possibly in French Guiana and Trinidad. Seen up to 1200m (3936 ft) in lowland humid forest and forest edge, and understorey. Found chiefly in terra firme forest but also varzea. Fruits, seeds, berries and small nuts. Is gregarious, sometimes seen in large flocks. Nests communally in dense foliage of upper tree crown.